Record App Store sales, European job creation, and... WWDC 2015 rumors? The dog days of summer might make for slow news days, but there's still some happenings in the Apple world that you should know about. Indie developers may be having trouble eking out a profitable living on the App Store, but the store as a whole continues to do well: Apple told CNBC on Tuesday that it achieved both record-setting App Store revenues and a record number of customer transactions in the month of July. The company declined to mention any specific numbers, but given Apple’s third-quarter $4.485 billion revenue from iTunes, software, and services, it’s not hard to picture a many-millions-of-dollars July on the online software marketplace. Over on Apple.com, the company is being far more forthcoming about other numbers—especially when they deal with European job creation. Apple has dedicated a page of its website to talk more about the 629,000 European jobs it supported or created in 2013. The data is based on an Analysis Group report, and highlights jobs in existence because of the European App Stores (497,000); the amount earned by European developers ($6.5 billion); European Apple employees (16,000); and number of Apple Stores across Europe (101) and their employees (10,000). The report also has information about Apple’s Ireland facility in Cork, its European suppliers, official Premium Resellers, and a country-by-country breakdown of Apple jobs. As popular as Apple might be in Europe, however, it’s hitting a wall over in China. Last month, China Central Television accused the iPhone of being a “national security concern,” which Apple refuted shortly thereafter. Now Bloomberg reports that the company’s iPad and MacBook lines are being excluded from the Chinese government’s procurement lists due to security concerns. 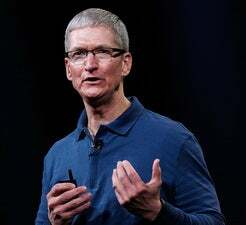 Ten Apple products in total have been removed from the final version of list, which dictates which tech gadgets can be purchased with state funds; the models were reputedly on the first version of the list drafted in June. The ABC News app has been live for merely a month on the Apple TV, but it’s already serving its parent company well. ABC released an infographic this week detailing the program’s first thirty days: According to the numbers, viewers watch 50 percent more live ABC News video on the Apple TV than on desktop and mobile combined, and spend 65 percent more time per visit using the Apple TV than when on their desktop. In other unsurprising news, people like watching television programming on their TV rather than on their computer. Who’d have known? Rumors about September iPhone events aren’t enough to fill the August news void, it seems: We need to speculate about 2015 events, too. MacRumors has taken a peek at Moscone’s booking schedule for the upcoming year and speculated that an unnamed “Corporate Event” booked from June 8 to 12, 2015 might well be the dates for WWDC 2015.